Thank you for coming to get this free pattern! The pattern is a FREE download through Ravelry. CLICK HERE to get the pattern. 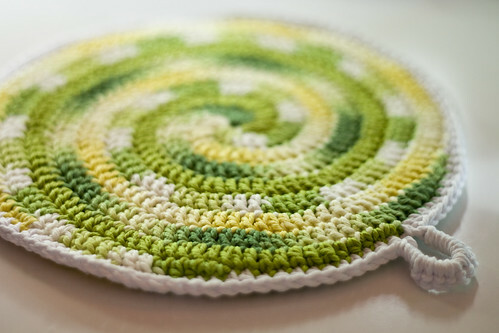 The Potholder Swap 2010 is in full swing—what fun potholders are you making? I can’t wait to receive mine from the swap, and making the ones I’ll contribute has been a lot of fun, too. I have even tried my pattern out, and they function pretty darn well! It wasn’t overly challenging, but it was a fun little crochet puzzle. I am loving the structural, physics-like way I can approach crochet. (Knitting is more garment design, crochet is more product design—the way I approach them.) With 4 colors at play in each potholder, the color combinations seemed endless, all of them fun and kitcheny. 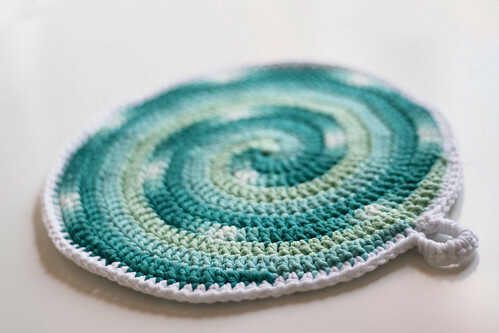 If you’re interested, my pattern for the Stir Me Up Potholders is available free via Ravelry, so you can download now and have a finished potholder in no time (each one takes me about 2.5 hours total—one hour each for the front and back, and half an hour to do the edging). That’s just one day of commuting, plus some time while I unwind at the end of the day. I don’t think I’m going to be able to stop at the 5 required for the swap. I have more worsted-weight cotton yarn to use up! I have more color combinations I want to see realized! I’m sure everyone I know needs even MORE potholders, right? Despite the fact that so many of my friends are already doing the swap? Someone described the spirals as being like candy—and perhaps that’s what making them feels like to me. Just a sweet diversion with happy-making results. 49 Responses to let’s get cooking! They really do look like candy. So cute! Very beautiful! They do look like candy, kitchen candy. Ok, so feel free to keep going, make five more, and put my name on them! Heh heh. Sadly the busyness of the semester will prevent me from learning to crochet in time to make potholders for this project. But I am standing from the sidelines and just loving all the different iterations I’m seeing! I don’t know what I’m more excited about. 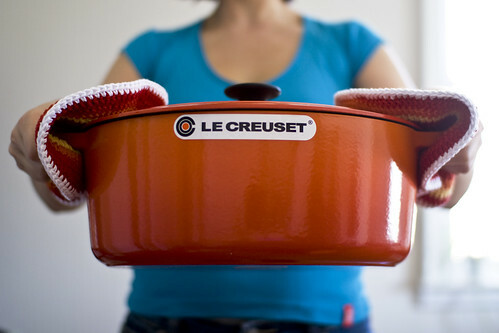 The potholders, or the le creuset! : ) I agree, they do look a lot like candy. I will definitely be knitting a few of these up! I’m having a very difficult time resisting. I love all things spiral. And even though I would typically gravitate towards something a bit more ornate, the tight deadline this year is pushing me towards your design, which I’m certain will work without any fuss :). I love your potholders. Gorgeous! Ooh! I love those spirals. What a great pattern. They will make excellent gifts for the cooks in my family. Thank you for sharing the pattern! My crochet skills are rusty, but hopefully I can figure it out. What fun potholders! I really love that last green one. Resist? Not a chance! I haven’t crocheted potholders in a bazillion years, but I just downloaded your pattern and will be whipping some up very soon. Gorgeous! I’d almost learn to crochet just to make these. They’re really fantastic. I love these! And as usual your pictures are awesome! You may have inspired me to join this swap. . .
oh, man, i love them all! wonderful pot & pot holders! I love my cast iron enamel! LOVE IT! Great design, nice colors and beautiful result ! I’m going to have a look on ravelry NOW ! I need to start one NOW! Thanks for the pattern. I love the wonderful colours! Looks like a quick and fun project. Thanks for sharing the pattern. I am a beginner, are these easy? I would like to try these patterns. Hi…I just love the look of these and would like to give them a try but am not very good at matching colors. Would it be possible for you to list the colors you used in the potholders you have pictured? Thank you for sharing this pattern!! Your instructions are calling for “reverse order,” do you mean just reverse it or reverse crochet? Your potholders are gorgeous and I would like to make some as gifts. How do you access the patterns? I REALLY LOVE THESE POT HOLDERS, THEY’RE ARE AMAZING. BUT PLEASE POST OR EMAIL ME A PATTERN. WHERE CAN I FIND THE PATTERN? COULD YOU PLEASE EXPLAIN “REVERSE ORDER”? THESE WOULD MAKE WONDERFUL PRIZES FOR A SHOWER. 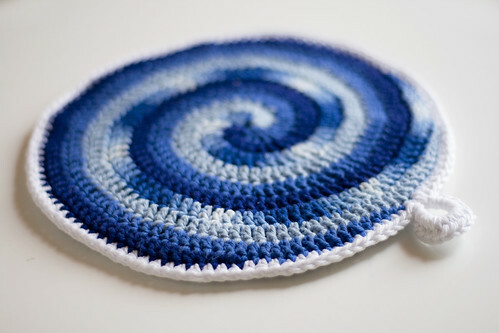 I really the spiral potholder it”s different and looks like it’s easy to do. 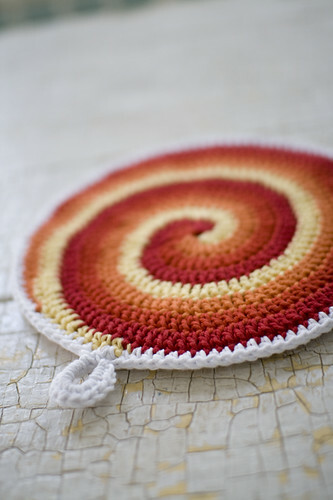 I have looked and looked at this info but do not find the pattern for the spiral potholders. Where have I gone wrong?? Click the words “download now” in the blog post. Thank-you for the cute potholder pattern-can’t wait to get to the yarn store! I love the way you tapered the colors-much nicer than having them just stop. i, too am looking for the pattern. thanks! The pattern is linked to within the post several times. I love these sooo much! Im going to make them for my mom and MIL but I was wondering if you could tell me the color combos you used for them… I really want them to match up right but have to order the yarn off the internet and dont want to get ones that dont match! Thanks a ton! These are beautiful. The pattern shows the colors for the orange ones. I’m interested in the red ones. Would you mind sharing the colors used for those? I’ve just made the front and back but can’t figure out how to align them to begin the edging. You mention that: “Note that holes will not align unless you have the potholders placed exactly right…” but I am unclear how exactly to position them. Are the “steps” matching up colors B with B or does the longer color A overlap some of the steps made by B/C/D?) A photo would be extremely helpful. I’m puzzled since we made them both exactly the same and then flip them wrong sides together, I can’t see how it’s possible to “align” them when they spiral in opposite directions. I’d so appreciate your help or any other crocheter’s help so I can finish these adorable potholders! I do love them! Thank you. these potholders are adorable! would love the pattern! 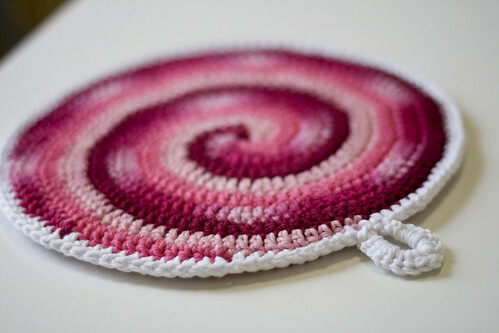 I would love to get the crochet instructions for the potholders that are spiral round. I really do confidence each of the ideas you could have available for ones write-up. These are persuading and might absolutely function. Even so, the actual blogposts are quite quick for novices. May just you want expand these folks just a little from next occasion? Appreciation for the actual article. Cute potholes. But need pattern so i can make it. Hope you have a different site for me to go to. I have been trying to get the pattern for this potholder but can’t fine it.Could you please send it to me?